When I was a young girl, I was a guest from time to time on Simcoe Island with my parents, to visit Bruce Orr and his family. They had a fantastic cottage there on the beautiful shore on this jewel of an Island. Bruce’s family had owned the land for a long time and actually his ancestors had been lighthouse keepers there since, I believe, the light houses were built. 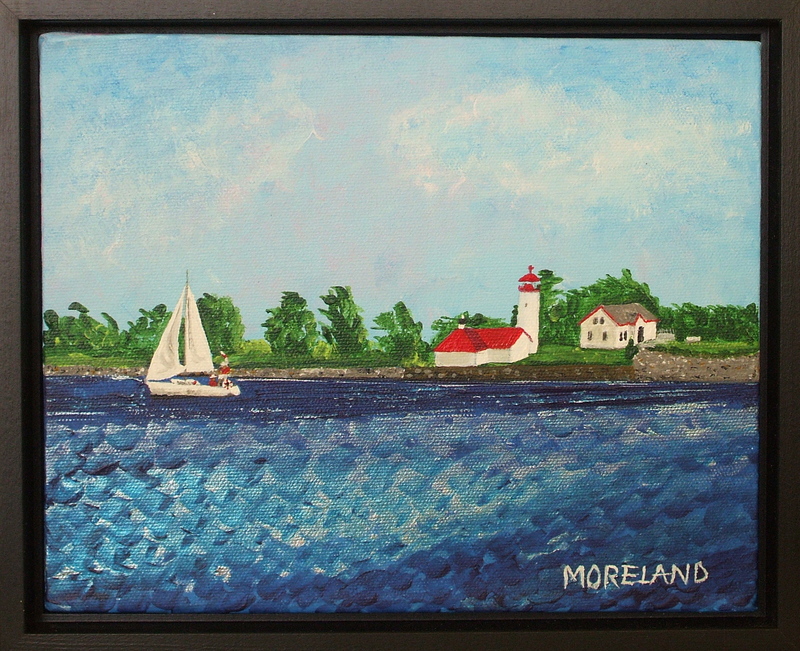 When I was a teenager and learning to paint he asked me to paint a photo of the Simcoe Island lighthouse for him. I tried, but I did not have the skills to do it. This is a genealogy link to the Orr family and this lighthouse. A beautiful painting. How interesting that I found this link today as I was just taking pictures of the same lighthouse last Sunday with my family. My husband and I met each other on Simcoe Island about 14 years ago, it is a very special place and I think your painting captures that. I will be looking for your work in future. One of my best friends on Simcoe (my wife and I own a cottage there) is Bruce Orr’s brother Bill. We have other good friends who currently own the cottage next to the lighthouse. I’m going to share this information with both of them. Bill is now the last Orr on the island and remembers very fondly the days that you talk about in your letter. Thanks for sharing your memories and your painting. It is wonderful to hear from you. I am so glad that you found this. How did you come across me? The internet is so huge and this is so small! I will have my paintings up in Portsmouth Village in a few weeks, at the Hatter’s Bay Market where they will be housed among other local items, food, candles, maple syrup and so forth. It seems to me that this is a very ideal location for a farmer’s daughter to have some paintings up! The proprietor of the store will allow them to stay for the summer. I will post more details about this soon. I am thinking that I should probably produce this one as a post card because Bruce’s family might like to have a copy and this is a very inexpensive way to go about making it available. All the best to you and yours as well as to Bill Orr.